It was a great Thanksgiving weekend, with visits from family, Black Friday shopping with my daughter and her friend and lots of food, including a pie made with cranberries and the last of my homegrown cherries. It was topped off with a visit to the Bachman’s greenhouses in Lakeville Sunday afternoon, courtesy of my friend Gwen and her husband, John, who works there. My camera fogged up a bit when we first got to the greenhouses. They felt so warm, compared to the cold outside. 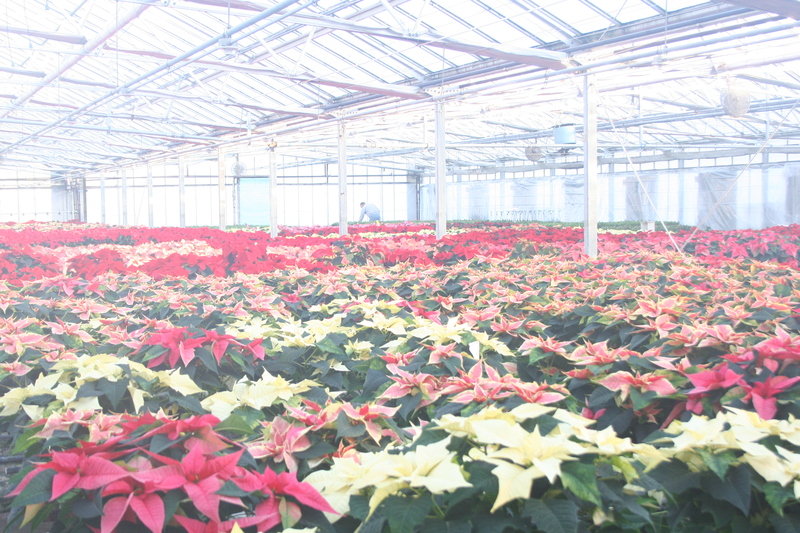 Bachman’s grows about 65,000 poinsettias each year. Many are sold at the Bachman’s stores and the rest are grown for organizations that sell them as holiday fundraisers. The greenhouses (I think we were in three different ones during our walk through) are enormous and two weeks ago, they were completely full, John said. 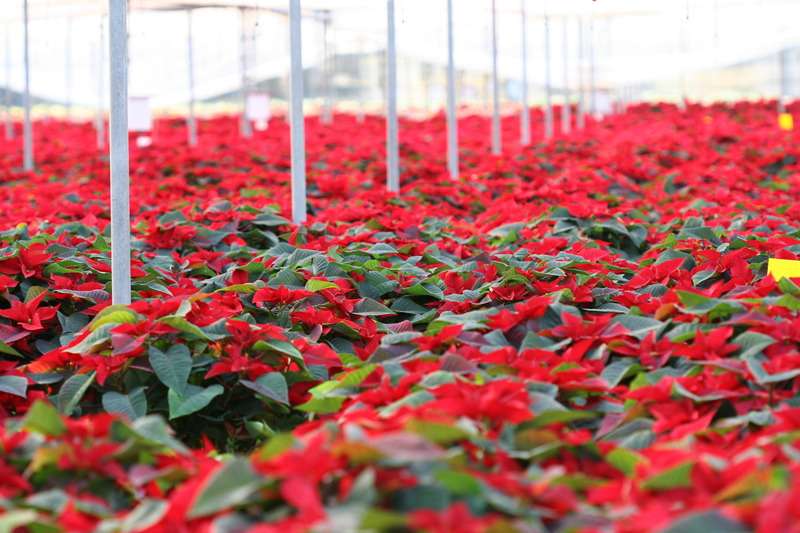 Now, many of the poinsettias have been shipped, but the ones remaining look like a sea of red, pink and white. These tall poinsettias were striking at about 4 feet tall. Poinsettias are native to Mexico and the English name came from the first U.S. ambassador to Mexico, Joel Roberts Poinsett. In Mexico, the plant will grow to 10 to 15 feet tall. (Bachman’s grows some poinsettias taller than the usual 1-foot or so size and they are stunning.) 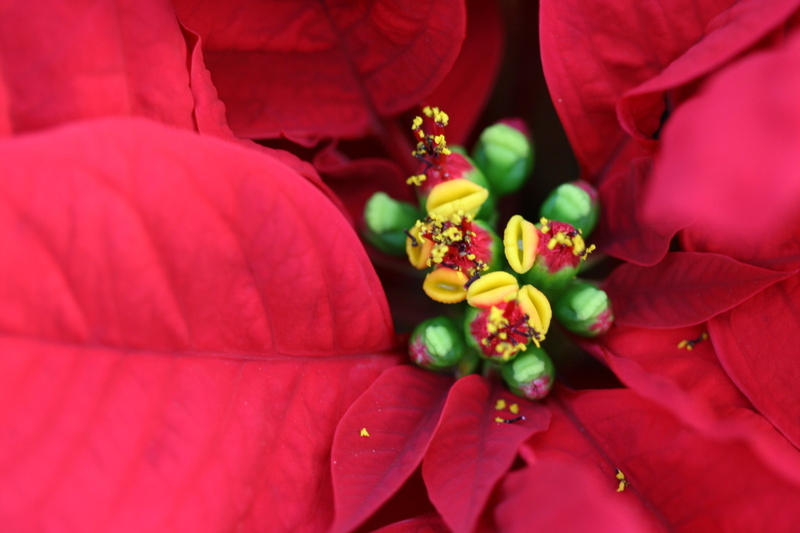 The Aztecs used poinsettia leaves as a dye and used the sap to reduce fevers. While poinsettias are not poisonous to humans, they can cause vomiting and other stomach upsets in animals. (They also taste terrible, according to this great poinsettia website.) 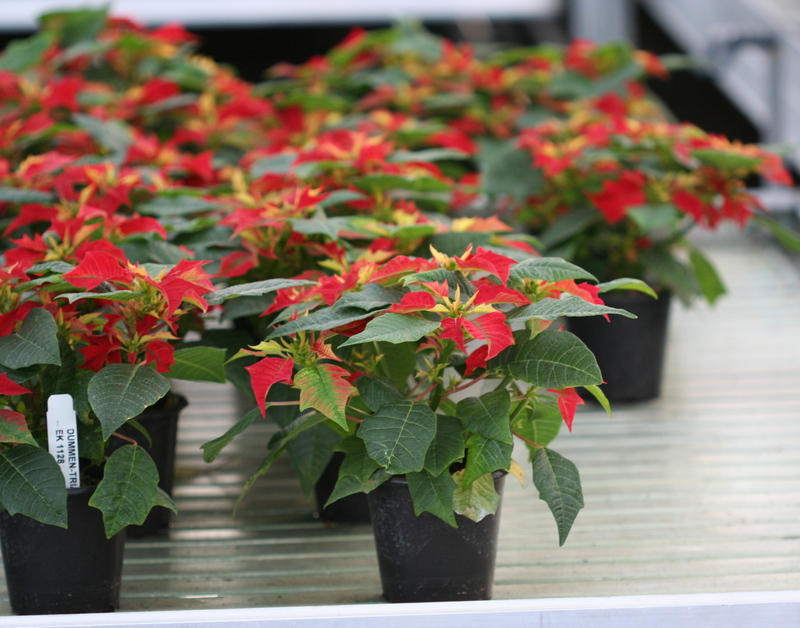 A member of the spurge family, poinsettias have the botanical name, Euphorbia pulcherrima. 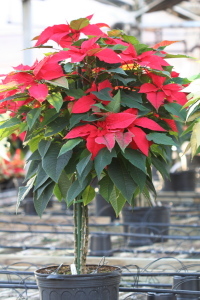 The brightly colored tops of the poinsettias are not actually flowers. They are brachts (modified leaves) and the tiny yellow bits inside the brachts are the flowers. These small poinsettias would be attractive in the office. With the right situation, poinsettias can survive the winter. Here are some tips for keeping your holiday poinsettia healthy. Try to give it 6 hours of indirect sunlight a day. (That may be tricky in Minnesota in December, but choose the poinsettia’s spot with light in mind.) Many sites recommend a south, east or west window, but the plant should not touch the cold glass. Will you be getting a poinsettia this holiday season? The yellow bits in the center are the flowers of the poinsettia. 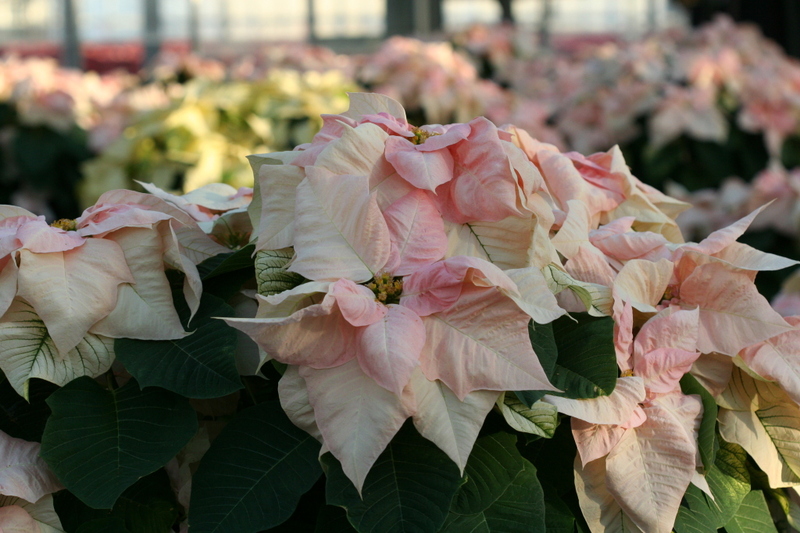 These pinkish white poinsettias would be a showy addition to your holiday decor. Those are beautiful photos! There is something to be said for mass arrangements.